Egg noodles are noodles made of wheat, eggs, salt, cornstarch, and oil. The dough is rolled out, and then cut into strips. Egg noodles may be bought fresh or dried. Fresh noodles should be used quickly because they have a shorter shelf life. All Chinese egg noodles are fast cooking, requiring 3 minutes for fresh noodles, and up to 10 minutes for dried noodles. Some Chinese egg noodles are quite long, since length in Chinese symbolizes longevity and good luck. Shapes range from rounded spaghetti-like noodles, square noodles, and slim fat noodles. Can come in spinach and whole wheat flavors. Choosing: Look for noodles that have not expired. Buying: Available both fresh and dried at Asian markets. They can also be made fresh at home, just like Italian style noodles. Available at grocery stores and retailers like Walmart and Target. 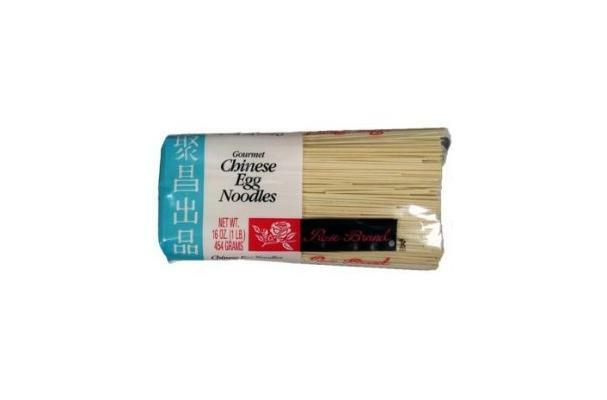 Procuring: Egg noodles are noodles made of wheat, eggs, salt, cornstarch, and oil. The dough is rolled out, and then cut into strips. Egg noodles are fast cooking, only taking at least 3 minutes for fresh noodles and up to 10 minutes for dried noodles. They are often cooked until they are slightly chewy, before they are drained and dunked in cold water to arrest the cooking process before being tossed so that they will not stick. Can be fried in stir fries, used as a base for stir fried food in sauce, fried in flat cakes as a base for other foods or for plain eating. Sometimes, they are broken into small bits like a condiment. Some chill and toss them with oil and sauce for a cold noodle salad dish. Cleaning: No need to clean noodles before cooking. Dried or fresh, egg noodles are most of the time coiled to save space. Fresh egg noodles must be used within several days and kept refrigerated, or they will go bad. Dried egg noodles have a longer shelf life so long as they are kept in airtight containers in a cool, dry place. Once opened, egg noodles should be used relatively quickly, or resealed in another airtight container. History: Although the Chinese, Arabs, and Italians have all claimed to have been the first to create noodles, the first written account of noodles dates from the Chinese East Han Dynasty, between AD 25 and 220. During the Chinese Song Dynasty (960–1279) noodle shops were very popular in the cities, and remained open all night.